Certainly one of the most recognized groups of flowering plants are flowering bulbs. Since most can be divided, dried, and shipped essentially rootless while dormant, it is only natural that a huge industry should develop around them. Just about anyone is familiar with flower bulb catalogs filled with tantalizing (and often over saturated) images of tulips, amaryllis, daffodils, and crocus. What big box store or local nursery doesn’t carry at least a few Christmas amaryllis or Easter lilies in season? From a more technical angle, one might ask just what makes a plant a flowering bulb, or for that matter a bulb bearing plant. Bulbs are in fact fattened stems, leaves, or leaf bases that are water and nutrient storing structures and often contain a growing point and/or an unexpanded flowering shoot within. Commonly, bulb forming plants go through an extended dormancy due to seasonal changes of their habitats – cold winters, hot and dry summers, and the like. 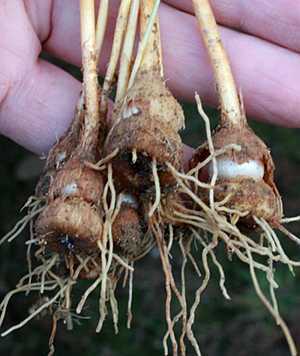 Most bulbs grow either underground or near the surface, but a in some species they can be formed along leaf axes on exposed stems (some lilies do this) and serve as a way of distributing new plants. In general, any underground storage organ is known as a geophyte.Not surprisingly, variety within this group is extreme. In truth many plants that are lumping into the category “bulbs” are not technically true bulbs at all. These would include stem and root tubers, fattened rhizomes, corms, taproots, caudices (fattened stems of woody plants), and even pseudobulbs (fattened above ground stems limited to orchids). If you peruse any flower bulb catalog you will find most of these represented for sale. Since all are commonly lumped in the horticultural trade, I will treat them as a group, but with the recognition of their distinct differences from both a structural and evolutionary perspective. What follows is a quick rundown of the various flowering bulb groups including examples.True bulbs – there are two basic types, tunicate and non-tunicate bulbs. The former are the commonly known bulbs best represented by the genus Allium (onions) with outer dry scales and inner layers of fleshy ones. Common genera include Narcissus, Oxalis, Tulipa, and some Iris. Less well know genera include the lovely and odd Asian Lycoris (spider lilies) and South American Ipheion (star flowers). Non-tunicate bulbs include Lilium and Fritillaria have no dry outer scales, but rather fleshy, more loosely arrayed ones. These usually can be divided from the main bulb to propagate new plants.Tubers – two basic types exist, stem and root tubers, but diversity is extreme within this group. They contain no scales, but rather are fattened structures designed to retain nutrients, water, and energy. Common stem tuber genera include potatoes, cyclamen, and tuberous begonias. Root tuber forming plants include Dahlia, some Ipomoea, day lilies (Hemerocallis) and a number of terrestrial orchid genera, such as Dactylorhiza, Habenaria, Pecteilis, Ponerorchis, and Pterostylis.Rhizomes – these are fattened, mostly underground stems that can withstand at least some drying. Both vegetative growths and roots grow from these structures. Common genera include most Iris, various gingers, trilliums, canna lilies, and some orchids such as Bletilla and Spathoglottis.Corms – these are short fatten underground stems that look very similar to tunicate bulbs and often even have outer dry scales (the tunic). They are unalike in that they are fattened stems with a different internal structure than bulbs, which are mostly composed of layers of fleshy scales. Common genera include Crocus, Crocosmia, Freesia, Gladiolus, and less well known plants such as Arisaema (jack-in-the-pulpits) and the terrestrial orchid species Calypso bulbosa.Taproots – these are fattened, vertically downward growing, and often large, roots. Common examples would be dandelions, turnips, radishes, and carrots. While many make great food plants, few are grown for their flowers.Caudices – these fattened, woody stemmed plants are much less well known. Desert roses (Adenium) however are sometimes considered within the realm of flowering bulbs.Pseudobulbs – these are mostly above ground fattened stems produced by the orchid family. In some genera these can be at or just below ground level, for example, many Calanthe, Cymbidium, Liparis, Phaius, and Pleione species. I saw my first spring star flower, Ipheion uniflorum, at the local botanical gardens in Fukuoka City, Kyushu, Japan about a decade ago. An extensive colony covered a south facing hillside and in early April put on such a show, it was hard to forget. A couple years later I was looking through the bulb racks at a local store and saw this plant for sale – four or five tiny rootless bulbs in a mesh bag. They didn’t look like much, but I remembered that hillside and quickly bought two bags. Much to my surprise the next spring they flowered a bright, cobalt blue – quite different from the paler flowered plants I saw at the botanical garden. Later I learned that I had bought Ipheion ‘Rolf Fiedler’, the subject of this article. This dwarf flowering bulb is green in the fall and winter, flowers in the early spring, and goes dormant in the heat of summer. Ipheion bulbs are small, perhaps typically not more than 2 cm long and look very much like a small shallot. This isn’t surprising since this genus is in the onion family (Alliaceae), and when bruised, the leaves and bulbs give off a garlic-like scent. The leaves begin growth once nights start to cool down, around mid fall in my area (zone 9). The 3-5 strap-like leaves never get that long in my experience, so they don’t look weedy or straggly, but rather form nice, tight clumps. The plants spread by thin underground stolons, at the end of which new offsets form. The thin, wiry white roots are typical of an onion relative. The flower of Ipheion 'Rolf Fiedler' is a bright cobalt blue, and a bit rounder than its near relative Ipheion unifolium. The flowers of I. ‘Rolf Fiedler’ are its greatest asset. They are born singly off a short flowering stem that stands not more than hand high, at least in my specimens. Unlike I. unifolium, the six petals are quite broad and rounded, oval in shape and have a distinctively darker color – a bright cobalt. There is a select clone of ‘Rolf Fiedler’ called ‘Jessie’ that is said to have the deepest color of all. The 2 cm wide flowers are radially symmetric and at their center the yellow-orange anthers provide a nice compliment to the otherwise blue flower. Blooming starts in April in my area, but in warmer places you may have flowers by mid March, or conversely, in colder climates, May. 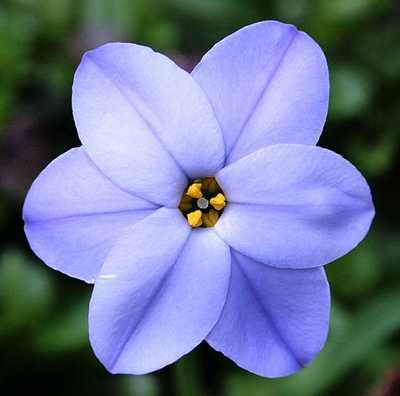 The flower is held more or less flat, but occasionally the petals can reflex a bit. Flowering is generous in healthy clumps and can last for several weeks. This plant is native to the low coastal hills of Uruguay in full sun. It is apparently native to only a small area unlike I. unifolium which can also be found in Argentina. There has been a lot of confusion about the naming of this plant – for a time it was considered a form of I. unifolium, but most authorities today feel it is a distinct species, though as yet undescribed. It differs from I. unfolium in a number of ways, most notably the richer flower color, and more rounded flower parts, making it not as star shaped. Recently, many botanists place all Ipheion species to two different genera, with the yellow multi-flowered species put into Nothoscordum, and the blue to white single-flowered ones into Tristagma. So, this plant has an identity crisis, being both an undescribed species while at the same time straddling two separate genera! The bulbs and leaves of Ipheion 'Rolf Fiedler' look much like small shallots - not surprising since this genus is in the onion family. Given its limited natural range, and its basically frost free habitat, one might think this plant would be rather tender. Interestingly it has shown itself to withstand at least USDA cold hardiness zone 6, while still being happy in zone 9. To put that in perspective, you can grow I. ‘Rolf Fiedler’ from southern New York state clear down to central Florida. Some say that it is a little less cold tolerant than I. unifolium, but apparently not by much. It has been suggested that their cold tolerance might be extended if drainage is excellent, with soggy soils inviting problems. In nature it grows in acidic, well drained soils that are evenly moist except in the height of summer when they can be quite dry for a short time. In my garden they get copious rainfall (1600+mm annually), especially during the early summer monsoon, right when they are going fully dormant. Later, in August, the oven turns on with average temperatures approaching 30 C, and for about 2-3 weeks it remains fairly dry. Apparently this is exactly what this plant likes since my original handful of bulbs have multiplied many times over, spreading over nearly a meter square. One fall I noticed that a small group began growing a good 20 cm away from the nearest clump and wondered if they seeded in, or spread by underground stolon. I found the latter to be true. To my knowledge, this species has not seeded in my garden. I will inspect their bed more carefully this year to look for evidence of seeding – a real possibility with Iphieon, which can actually be very weedy in some circumstances. To summarize growing conditions for this dwarf bulb – plant them shallow in a sharp draining, yet moist, gritty loam or sandy soil with a pH range from moderately acid to slightly basic (~5.5 to 7.5). Plant in full sun for best results, particularly if you live in a cooler climate, but they also can handle light shading. Avoid watering in summer during dormancy. Fertilizer may be added as you see fit, but honestly, any good soil can maintain these plants without amendments. Overly acidic soils should be sweetened with lime, and heavy clay soils lightened with porous materials, but watch out for pure sand. If mixed with heavy clay you can end up making concrete! Honestly though, these really are pretty simple plants to grow and flower, probably the closest thing to a no maintenance flowering bulb. Ipheion 'Rolf Fiedler' puts on a a lovely display in early spring, and with little effort. Those living in the mid south should be able to grow this Ipheion with impunity. Even if you live in a slightly colder climate, go ahead and give them a try. They make pretty border plants when mixed with other bulbs, say Muscari or dwarf tulips, or as a mass planting for a subtle, yet impressive show. Ipheion take up so little space, and are so undemanding that it is well worth trying a few – you may just fall in love if you do. A lovely little flowering bulb from the mountains of western Turkey is Chionodoxa forbesii, also known as “glory of the snow” since it has the habit of flowering so early that it pushes right up through the snow. The first time I saw this species at a garden center it was the cultivar ‘Pink Giant’, and I mistook it for some kind of dwarf hyacinth. Later, when I saw the typical blue flowered form, I immediately realized this was a close relative of Scilla, yet still a member of the hyacinth family. This dwarf bulb is no giant, regardless of its clonal name. Full grown plants stand between 15-20 cm tall, perhaps a bit higher than the usual wild blue flowered form. This species has true tunicate bulbs that are somewhat elongate with a distinct growing point, each ~ 5 cm long. The leaves, numbering two to three per bulb, are dark green, narrow and somewhat fleshy, and stand erect. They rise synchronously with the flower stalks, and persist only into late May or early June before going into dormancy. 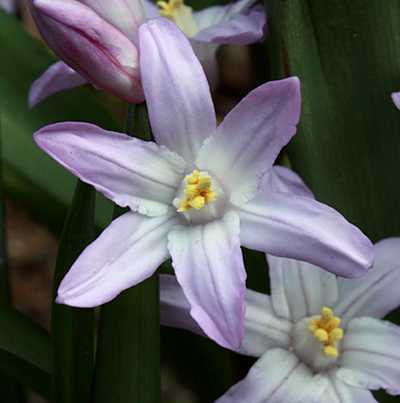 The flower of Chionodoxa ‘Pink Giant’ is star shaped and a pale lavender. Each bulb can have more than one inflorescence, yet mine seem to be limited to one. It stands perfectly straight, is suffused with purple, and is just a bit taller than the leaves. Flowers number between 5-8 per stem, are held more or less facing upwards, and are around 3 cm in diameter. The six sepals and petals are fasciate, that is, fused at the base and slightly cupped, forming a lovely star shape. The bright yellow stamens and pistol are held in a tight bundle at the flower’s center. Flower color in this variety is more pale lavender, rather than true pink, and as with the blue form, the base of the flower segments are pure white. As its common names suggests, Chionodoxa are early season flowers, though not as early as Hepatica species or snowdrops, which truly do sometimes break through the snow to bloom. In my southern Japanese garden this plant flowers alongside early blooming Narcissus, usually from late March to early April, some weeks after the latest snowfall. The flowers are fairly long lived, even under rainy conditions, but look best on sunny days. This genus is confined to the islands of Crete and Cyprus, as well as western Turkey. C. forbesii is found only in southwestern Turkey at higher elevations (>2500 meters), a place where snow persists into this plant’s flowering cycle. Its Latin name reflects this habit, with the Greek words chion meaning “snow”, and doxa translated in this case as “glory”, thus rendering “snow glory”. Interestingly, the original meaning of doxa was “to expect or seem” impling a common belief system (as in the word orthodoxy, for instance), however, during the translation of the Hebrew Scriptures into Greek, it was assigned a new meaning, “glory”. The leaves of Chionodoxa forbesii are held vertically and are just a bit shorter than the flower stalks (in this picture the flower stalks have not fully grown). There has been quite a bit of confusion in the scientific naming of this genus, with the species C. forbesii, C. gigantea, C. luciliae, and C. siehei often being confounded. From what I’ve read, C. siehei was confused with C. luciliae for many years, and has since been merged under C. forbesii. C. gigantea appears to be a defunct name. For further clarification (?!) reference this 2005 RHS publication – “Little Blue Bulbs”, p. 5. Not surprisingly, C. forbesii ‘Pink Giant’ has been, and continues to be, marketed under a variety of species names. If this weren’t enough, some botanists don’t even agree that the genus Chionodoxa is distinct from Scilla… and so it goes. The warmer areas of Japan are home to the orange surprise lily, Lycoris sanguinea. It can be seen growing near streams in deciduous woodlands as well as open moist grasslands. While not as showy as its brethren L. radiata, it flowers a full month ahead, right in the midst of the deadly heat of August. The leaves of Lycoris sanguinea start growth in winter in my garden. They will grow a bit later in colder winter areas. Just as the rains of the summer monsoon abate and the oven turns on in southern Japan’s forests, this odd flower shows its face. Starting in late July the single flower scape grows with its sheathed clump of buds to height of 40 cm or more. 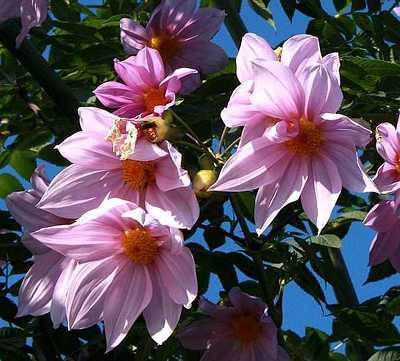 By mid August a loose truss of 3-6 light orange, spidery flowers, with their pistil and stamens protruding well beyond the petals, hang in summer heat. They last up to a week or so before giving in to the sweltering temperatures. Seed set is fast and by mid fall you hardly know there was a plant growing in that spot. 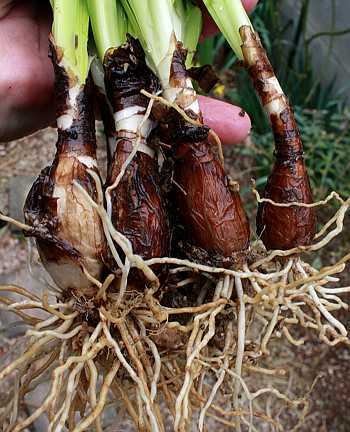 The bulbs are completely subterranean and remain dormant until February when the new leaves begin their growth. These expand quickly in broad arching clumps of blue-green strap-like leaves, 30-60 cm in length. They remain green throughout the spring and early summer monsoon, going down sometime in mid July, a few weeks before the flower stalks initiate. Lycoris sanguinea is represented by two varieties in Japan, v. sanguinea and v. kiusiana. The latter is a larger plant overall, but otherwise is very similar to the standard type. A third variety, v. koreana, is rare and synonymous with L. koreana, a species found in South Korea and the islands between Japan and Korea. I have not been able to determine which name is considered valid for this type since both are used by various authors. The flower of Lycoris sanguinea doesn’t quite live up to its name, which means “blood”, but it is still attractive. Like other members of the genus Lycoris, this species exhibits natural polyploidy, that is, any given plant can have extra sets of chromosomes. Both Japanese varieties are represented by fertile diploids (2n=22), sterile triploids (2n=33), and even some fertile tetraploids (2n=44). This pattern holds for v. koreana as well. Regardless, in general L. sanguinea is a fertile species with regular meiotic division, unlike many Lycoris species and hybrids. The upshot of all this is that L. sanguinea is self reproducing by seed and its distribution throughout southern Japan from the Kanto Region of Honshu southward to Shikoku and Kyushu speaks to this. It also means this species is a useful parent in producing new Lycoris hybrids – a somewhat rare trait in this bizarre genus. I first came across this species one late winter day on the largest mountain in the Fukuoka City area, Mt. Sefuri. Free flowing, dam-free rivers are a rarity in much of southern Japan and Mt. Sefuri has a lovely stream that has been altered little through the years. Its banks also retain the natural flora of the area, including a largely deciduous forest at the relatively high elevation (600~1000 meters). Forests just a couple kilometers away at lower elevations are dominated by broad leaf subtropical evergreen trees. The bulbs of Lycoris sanguinea look much like Amaryllis, which isn’t surprising since they are closely related. While walking up the stream and admiring its aquamarine blue plunge pools, I noticed a broad leafed plant not unlike a Narcissus species coming into growth. It was growing in clumps here and there all along the watercourse and surrounding forest. As I headed further upstream I was confronted with fields of them growing in a near carpet under the leafless trees. Huh, now what kind of plant was this? I took a few bulbs that had been washed out from the winter snow melt at the river’s bank and headed home. The plants grew well for me and went dormant midsummer. A larger cousin to the red spider lily is Lycoris aurea, the golden spider lily. It is bigger in all respects – the flowers, leaves, and bulbs are half again as large as L. radiata. It’s broad trusses of golden orange blossoms always remind me of deciduous azaleas. Their appearance in the fall months is a welcome spot of color at a time when many plants are preparing to go dormant. In fall, from a fairly large, amaryllis-like bulb growing just below the surface of the ground, fleshy flower stalks sprout. By mid to late October it is in full flower with up to 8 spidery, orange yellow blooms. The tepals are all the same length, have undulating margins, and curve backwards. The stamens and pistol project in a upward curving arc in the opposite direction from tepals, but are usually the same length. The flower of Lycoris aurea is the largest of the genus. 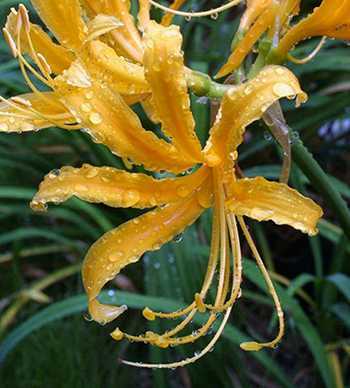 The flowers of L. aurea are held in a circular truss that looks much like a deciduous azalea when seen from above. Each truss can be up to 20 cm across with any given flower about half that size. 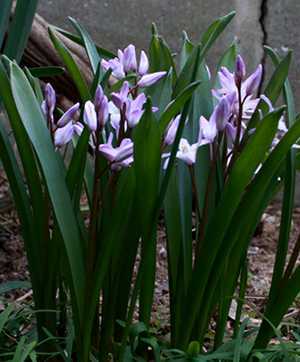 After the flowers fade, several somewhat fleshy broad leaves sprout from the bulb. These are finished growing by mid November and are up to 70+ cm long each. They persist through the winter months, finally going dormant in mid spring. 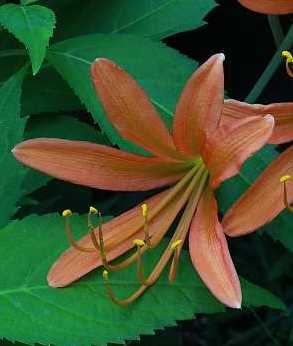 The above ground plant remains fully dormant throughout the summer months, until it flowers in October in a leafless state – hence another common name for these plants, surprise lilies. There is some confusion concerning the naming of this plant and the closely related Lycoris traubii. 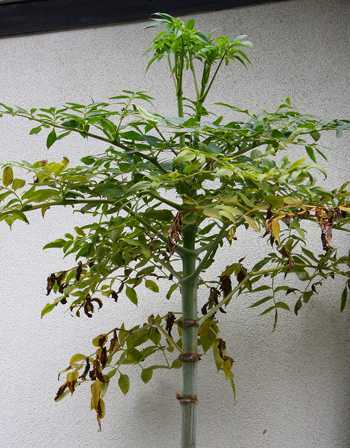 Sources commonly report L. aurea being a plant of south China, but also having a range extending into parts of Indochina, Taiwan, and southern Japan. L. traubii is considered only native to Taiwan and Japan and for all practical purposes is very difficult to tell apart from L. aurea. The Japanese Ministry of the Environment does not even list L. aurea as a species native to Japan, but does list L. traubii (Kagoshima and Kochi Prefectures, reported extinct in the latter). Not all Lycoris aurea are able to set seed, but one of my plants does so every year. Supposedly only plants with a chromosome count of 14 are fertile. L. aurea has been given at least one varietal name, v. angustitepala, restricted to south-central China. Within the species concept of L. aurea all plants seem to be diploid (2n), yet the chromosome count varies between plants with 12, 13, 14, and 16 being commonly cited. It is said that only plants with 2n=14 are fertile. Moreover, it has been suggested that L. traubii may in fact be a local variant of the more widespread L. aurea. Japanese plants of L. traubii are said to be fertile. Many Lycoris plants have similar and confusing histories. L. aurea has been cultivated for many centuries and it is likely that at least part of the confusion is the result of human tinkering. Plants sold as L. aurea can be of hybrid origin as well, so telling what is what can be confusing. 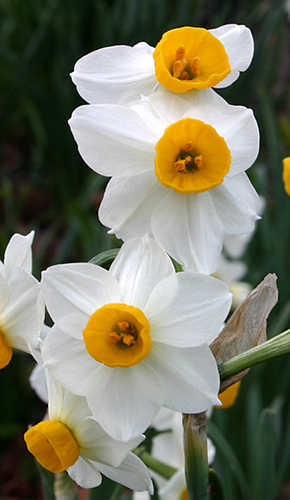 Southern Japan year round is a place of flowers and no plant exemplifies that more than Narcissus tazetta, Japan’s answer to a paper white daffodil. This plant can be found in various stages of bloom anytime from late December through February along the roadsides and fields of southern Japan, precisely during the coldest weather. 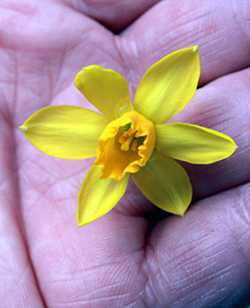 It is member of the tazetta daffodils – those species and hybrid daffodil that have clustered, cup shaped flowers, and flower during the winter months into early spring. 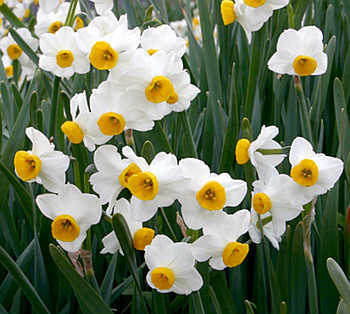 N. tazetta is close relative to the most famous member of the group, Narcissus papyraceus, the common paper white. The cheerful flowers of Narcissus tazetta v. orientalis grace the roadsides and fields of southern Japan during the height of winter. In late autumn the new leaves emerge, forming large clumps, sometimes almost carpeting the ground. They look like most other daffodil leaves, long and thin, and blue-green in color. Each can be up to 60 cm tall when full grown, but most clumps don’t exceed 40 cm or so. 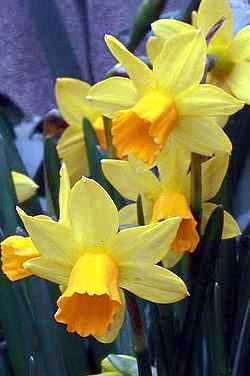 Perhaps more than other types, tazetta daffodils form large clumps, in fact it is nearly impossible to find a plant that isn’t in a clump. If you lift a group of N. tazetta you’ll find its bulbs clustered in masses. They are typical tunicate bulbs, as with all members of this genus. 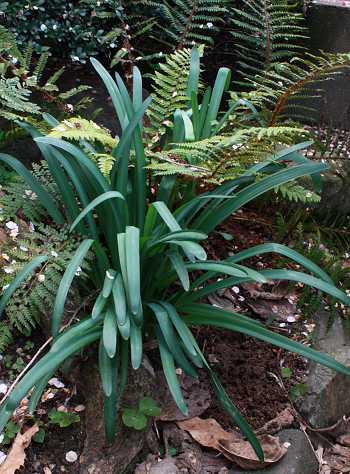 Each bulb supports anywhere from 2-5 leaves, and usually one flower stalk. These grow throughout the winter into early spring when the plant goes fully dormant. The flowers are born in clusters on long stems that match or exceed the highest leaves. Each cluster has from 1-7 cup shaped flowers. The typical flower color is white and orange yellow, but very pale colored forms exist as well as pure yellow flowers. The six outer petal-like segments (called the perianth) are usually pure white and slightly reflexed backward. The inner cup like structure (called the corona) is orange-yellow in color. The flower gets its name, tazetta, from the Italian word tazza, which is a shallow wine cup – a reference to the bowl shaped orange corona of the flower’s center. It is the corona that gives this plant the species epithet, tazetta, from the Italian word tazza, which is a shallow wine cup on a pedestal-like base. The flowers last 2 or more weeks long and tend to open at one time. Their odor is intense, but not unpleasant, and much more floral scented than the musty smell of N. papyraceus. They are frost resistant to several degrees. 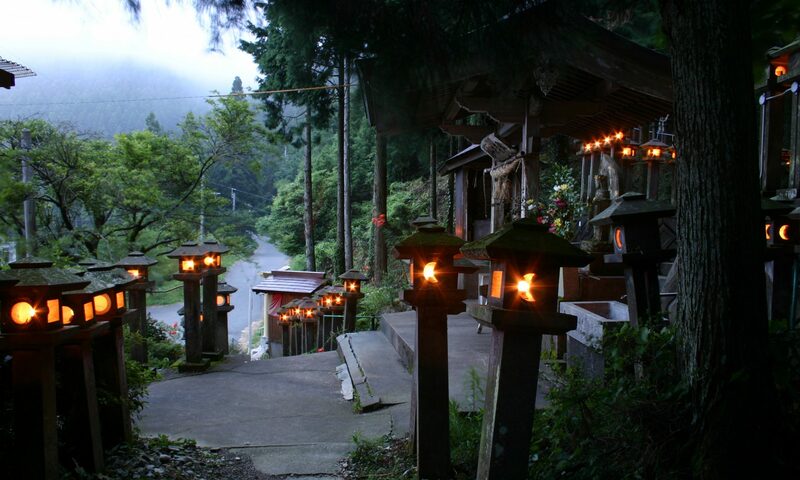 In Japan N. tazetta can be found in the warmer regions of Honshu, Kyushu, and Shikoku, but is not native. It is thought that it came from China centuries ago, represented by the variety orientalis (AKA v. chinensis), but very likely was brought to that country in the distant past from the Near East along trading routes. In Japan it is found on roadsides, on rice patty embankments, along rivers, and in vacant lots in both agricultural and urban environments. A number of different flower forms and hybrids are frequent garden plants in Japan and elsewhere. The commonly grown N. tazetta ssp. italicus is in fact the hybrid between N. tazetta and N. papyraceus, the paperwhite narcissus, and is an import from Italy. Unlike its parents, it is a sterile mule, and so can only be increased through division. Saffron crocus is an autumn crocus, flowering in October and November. Crocus sativus bulbs are not true bulbs, but rather corms that closely mimic tunicate bulbs, complete with a dry outer sheath or tunic. In mid fall the leaves begin to sprout and grow just before the flowers emerge, or sometimes just after flowering. The blue-green leaves are long, thin and grass-like, growing up to 30 cm long, and have a lighter green vein down the middle. Each corm supports 5-10 of these. The leaves remain green throughout winter, dying back in spring. The above ground plant is fully dormant all summer. The flowers open simultaneously. Each is around 6 cm across, and bears 5-6 broad lilac-purple petals with darker veins. The style is three pronged with each terminating in a stigma – the female part of the flower. The bright yellow anthers, also three in number, bear pollen, yet it is sterile, so no seeds can be produced. C. sativus is a autumn crocus, with flowering commencing in late October into late November depending on location and weather conditions. Saffron is the dried style and stigmata of Crocus sativus. These are freshly collected. 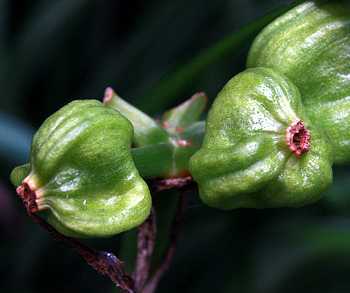 The origins of C. sativus are not well known given its long history in cultivation. It is thought to be a selectively bred form of the naturally occurring C. cartwrightianus, a native of Greece and the Cyclades, an island group in the Aegean Sea. This species however has smaller flowers and the style/stigma lack the flavor of C. sativus. Unlike its triploid cousin, it is seed producing. Today saffron crocus is grown across the world in any suitable climate. 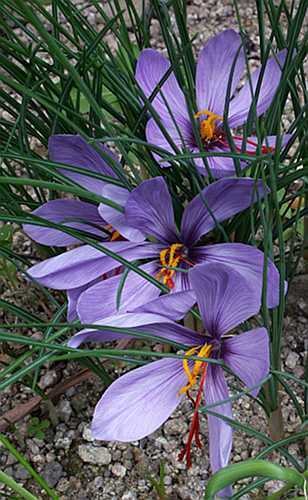 While it makes a lovely flowering bulb for the garden, it is mostly grown for the valuable spice, saffron. It has been grown for this purpose throughout much of Europe, the middle east, India, China, and even New Zealand and the USA. Today, Iran is the largest producer, yet Spain is the largest exporter. To this day no spice by weight is more expensive than saffron. Like many natural herbal products, saffron contains a wealth of aromatic and volatile chemicals, giving its flavor and smell, as well as nonvolatile substances, such as carotenoids, that provide color and flavor. 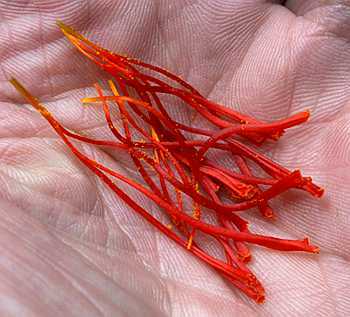 One of saffron’s most celebrated constituents is safranal, a volatile oil that furnishes most of its aroma. The spice is dried and must remain so to preserve this exotic cocktail of chemicals, therefore it must be kept in well sealed containers. Crocus sativus bulbs are not true bulbs, but rather corms. Each lasts just one growing season, but can be replaced by many more. Throughout its history saffron has been used as in dyes, in perfumes, in medicines, in body washes, as a narcotic, in aphrodisiacs, as an antidepressant, in potpourris, in make up, and of course as a spice, both coloring and flavoring all manner of foods and spirits. While historical use of saffron for a wide range of ailments is well documented, more recently it has been studied for possible anticarcinogenic and antioxidant properties. Central Asia is home to two species tulips that are remarkably resistant to hot summers and conversely cold winters. They are respectively, Tulipa ‘Little Beauty’ and Tulipa clusiana v. chrysantha. Moreover, both seem quite happy to grow and flower, and even increase over time with little maintenance in the hot, wet summers of southern Japan where I live. These two flowering bulbs are a must have in any suitable garden. Tulipa ‘Little Beauty’ certainly lives up to its name. The flowers are borne in small clusters and open all at once, giving a stunning display despite this plant’s dwarf habit. While both are commonly available in the trade, their naming is a bit confusing. T. ‘Little Beauty’ is a cultivar that has been listed as a form of T. hageri by some, T. humilis by others, as well as T. pulchella (a plant often considered a form of T. humilis). Variation within T. hageri and T. humilis is extreme, making the situation even more confusing. T. clusiana has two color forms, white and yellow. The outer surfaces of the tepals are a lovely reddish-purple, giving flower even more interest. The yellow form is known as var. chrysantha and it is this plant I have experience with in the garden. Again, the naming of this tulip has been confusing with some considering it a yellow variety of T. montana, and sometimes it is sold under the name T. chrysantha. Naming aside, both are lovely and rewarding garden plants. 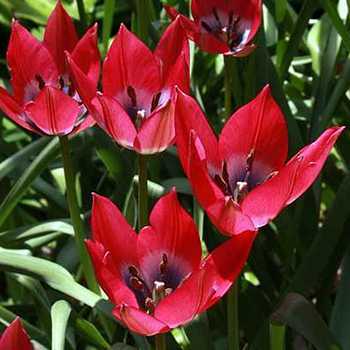 T. ‘Little Beauty’ is an extremely dwarf tulip, standing not more than 15 cm tall. Each growth offers a cluster of large, long lasting flowers borne on short, stout stalks. Each one is up to 6 cm across. The outer part of the tepals (the collective term for both sepals and petals) are a lovely reddish-purple suffused with varying degrees of pink. The center is a rich blue with white edging. Flowers open en masse and offer a stunning display. T. clusiana v. chrysantha is no less stunning a flower, though the plant is taller, up to 30 cm or more. Each growth sports a single flower, but in a mass they are truly something to behold. While the outer surfaces of the tepals are strongly colored orange-red in this form, when the flower is fully opened and viewed from above it is the purest of yellows throughout, including the stamens and pistol. The flower stalks are quite a bit longer and thinner than in T. ‘Little Beauty’ and more subject to damage from high winds or rain. Both plants are highly sensitive to sunshine, or the lack thereof. On overcast days the flowers close up totally. In the case of C. clusiana v. chrysantha that makes the red coloration more evident. Once the sun comes out, both open fully, showing their stark beauty. The bulbs look much like any tulip bulb, but are much smaller, not more than 4 cm in diameter. These are true tunicate bulbs with a outer layer of dried sheath-like scales and embryonic tissues within that develop into the leaves and flowers. The leaves of both species are nothing special to look at – again, very tulip looking, light blue green color, but more narrow than the large hybrids. The leaves of T. ‘Little Beauty’ grow more prostrate to the ground than T. clusiana. The ornamental value of them is limited and their brief appearance (only about 2 months) doesn’t give you much time to see them anyway. 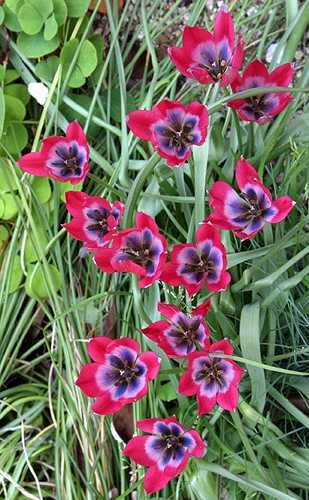 The flowers of Tulipa ‘Little Beauty’ remain somewhat cupped even in the full sun. 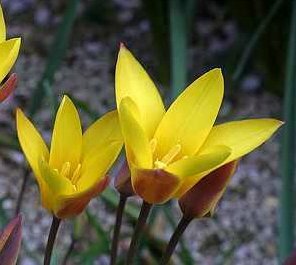 Tulipa clusiana v. chrysantha is very responsive to the sun, opening and closing depending on its intensity. Here the flowers are half open in the weak morning sun, revealing the orange-red coloration of the outer tepals. These plants are from south central Asia, an area with hot, dry summers and fairly severe winters. Flowering commences early in southern Japan, usually starting in early April. Depending on the weather, each flower can last for a week or more before fading. The leaves stay green for perhaps 6 more weeks and go totally dormant by late June, right in time with the onset of Japan’s intense monsoon rains. The plants remain out of sight until the following spring when they again make their brief appearance. This does not mean they are totally dormant, just that the leaves are. While it is said that they prefer drier, hot conditions in summer to do well, in my experience, both weather out Japan’s monsoon without any trouble. Some years the monsoon can last up to nearly two months and over a meter of rain can fall in that short time. I have never lost any to rot during this period. I can’t say this is the optimal way of growing them, but they don’t seem to be adversely effected either. I have heard that they should not be planted in cold, wet soil since this invites rot.